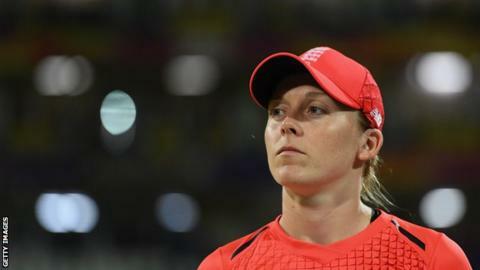 England's women can be "let off the leash" in the Twenty20s in India, says captain Heather Knight. The tourists, who lost the one-day series 2-1, play the first of three T20s in the north-eastern city of Guwahati on Monday at 05:30 GMT. "It gives us a chance to play with freedom," Knight told BBC Sport. "We're excited to change format. We've been in successful in T20 cricket over the past couple of years." England struggled with the bat in the ODIs in Mumbai - they were bowled out for 136 and 161 in the first two matches before recovering from 49-5 to chase 206 in the final match. Knight said: "We have some exciting talents and it is a chance for them to be let off the leash without the pressure to craft an innings." England reached the final of the World T20 in November, beating India in the semi-finals before losing to Australia. England's three spinners from that final are all unavailable, with Danielle Hazell having retired and Sophie Ecclestone and Kirstie Gordon injured. Off-spinner Laura Marsh, who has not played a T20 for three years but was part of the team that won the World T20 in 2009, is in the current squad but has been struggling with a side injury and illness. It could mean an opportunity for Linsey Smith, who played two games at the World T20, and fellow slow left-armer Alex Hartley, who stayed on after the ODIs to cover for Ecclestone. India will be captained by Smriti Mandhana in the absence of fellow batter Harmanpreet Kaur.